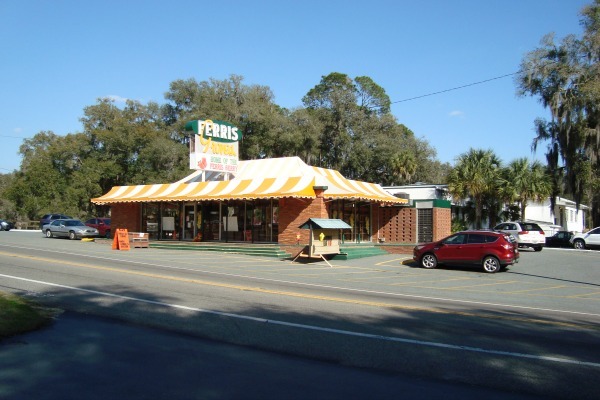 Floral City, about 70 miles north of Tampa, has been the home of Ferris Groves since 1931. L. G. "Doc" Ferris started out as a boom time land developer in the 1920s but like almost everybody else in Florida back then, he went bust after the major hurricanes came followed by the Great Depression. 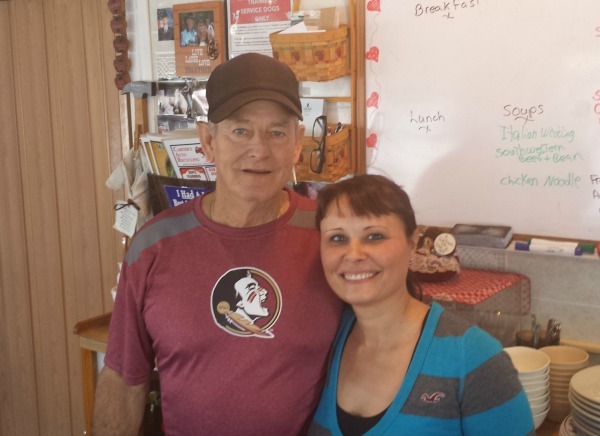 He owned a lot of land in Floral City, including Duval Island on Lake Tsala Apopka. Instead of developing a golf course he planted citrus trees on the rich soil of the island. At the peak of his operation he had 350 acres planted with 31,000 trees. Almost everyone in Flora City worked for Doc Ferris. Doc was reportedly the grand nephew of George Washington Gale Ferris, Jr., the inventor of the Ferris Wheel. 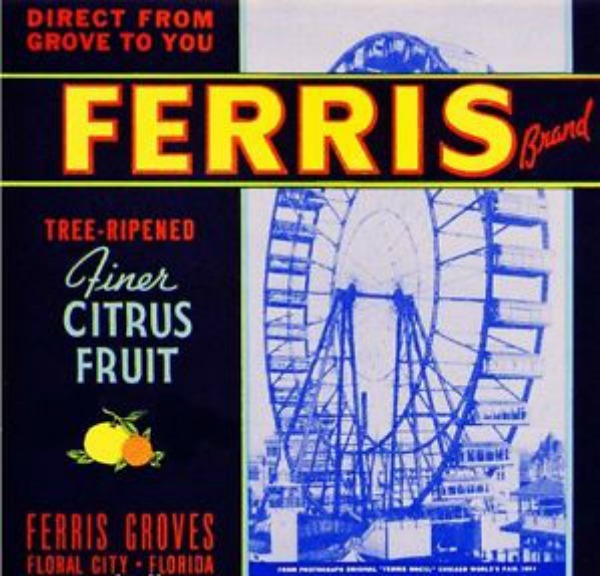 Ever the promoter, Doc added a picture of the Ferris Wheel on some of his early citrus box posters. He also built fruit stands along many major Florida highways and even had fruit stands in some of the tourist hotels in Miami Beach. Among those early stores was the current one on U.S.-41 in Floral City that still does a great business. I bought some great tangerines there recently. Even though most of Central Florida's citrus industry was wiped out in the freezes of 1983 and 1985, the fertile hammock soil of Duval Island still produces Valencia oranges, Ruby Red Grapefruit and Fall Glow tangerines in its 24 acre grove. In recent years they have added strawberries and blueberries. Their delicious strawberry is named the Ferris Berry. Fruit bearing trees are not the only hallmark of Floral City. 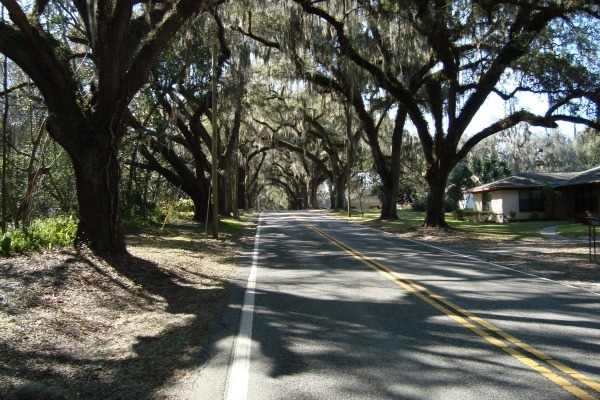 This small community of about 5,000 people has done a good job in preserving the old oaks and native palms that give the town so much of its current day charm. It's a good place to park your car and just walk or ride your bicycle. There is a pioneer museum downtown and a couple of neat art galleries and antique shops along with a produce stand. 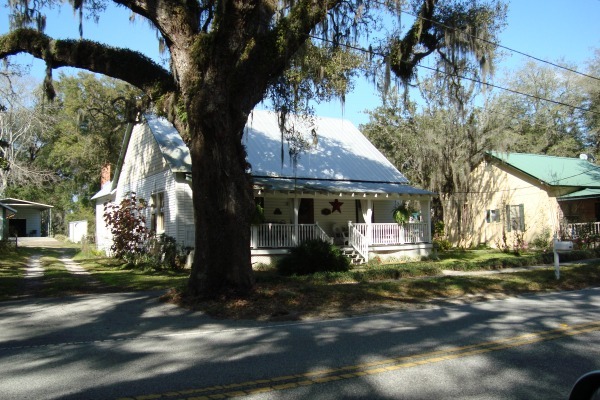 The neighborhoods surrounding downtown are a treasure trove of authentic old Florida houses and other buildings. The Withlacoochee State Trail is a 46 mile long paved corridor that runs through Floral City. It's a "Rails To Trail" project that was formerly a historic train route that was sold to the state in 1989. 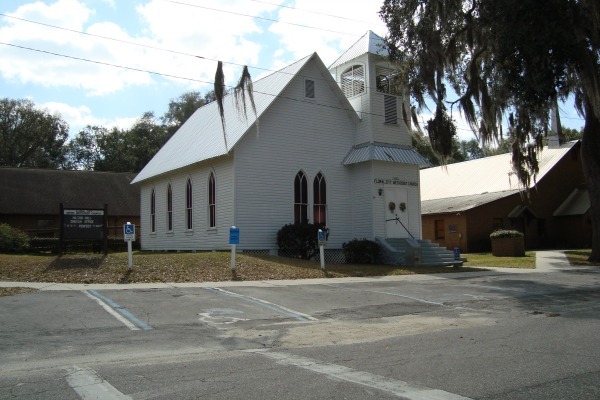 Its northern end is in Dunnellon, and its southern terminus is the Trilby trailhead southeast of Brooksville. It is for hikers and non-motorized vehicles only, and runs through small towns like Istachatta, Floral City and Inverness. Along the way it crosses several ranches, natural woodlands and wetlands and is close to Fort Cooper State Park and The Withlacoochee State Forest. Floral City is set up to cater to hungry and thirsty cyclists with several restaurants and stores near the trail's crossing in downtown, and there is also a bike shop that provides not only bicycles but repairs and advice. The community is built along the shorelines of Lake Tsala Apopka and Bradley Lake. 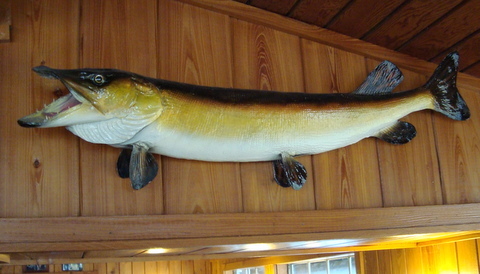 There are many fish camps and authentic old Florida lodging places in the area along with some great fishing and canoeing. Some of the back country roads around these lakes and their many islands offer some of the best driving experiences in Florida. 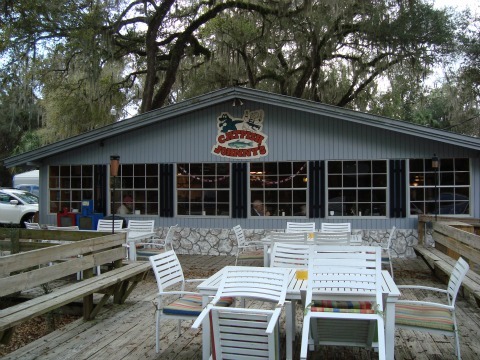 Catfish Johnny's is a modern restaurant in the settlement of Lake Panasoffkee. As implied by the name, catfish is served in this restaurant along with a lot of other delicious items. The restaurant is on the main highway through town, and serves mainly locals and occasional travelers from nearby I-75. The day I visited, the customers were about evenly divided between real cowboys and fishermen along with their female counterparts. Sumter County is known not only for it's great fishing, but for its substantial cattle ranches. There is plenty of seating inside the rustic dining rooms. A few mounted fish and a gator skull decorate the walls. You do not have to get dressed up to enjoy dining at Catfish Johnny's. I had a platter of fried catfish fingers, with french fries and cole slaw. With a cup of coffee, my entire lunch bill was under $10 including a 20% tip. The service was prompt and friendly, and the food was delicious. Although fried, it was not greasy and the fish was very tender. A very good experience. Other items on the menu include oysters, frog legs, shrimp, soups and salads, wings, grouper sandwiches and Alaskan sea perch. For the non-seafood lover, they also have grilled chicken breasts, chicken tenders, chopped steak and a 12 ounce grilled Delmonico steak. It would be virtually impossible to leave this restaurant and still be hungry. 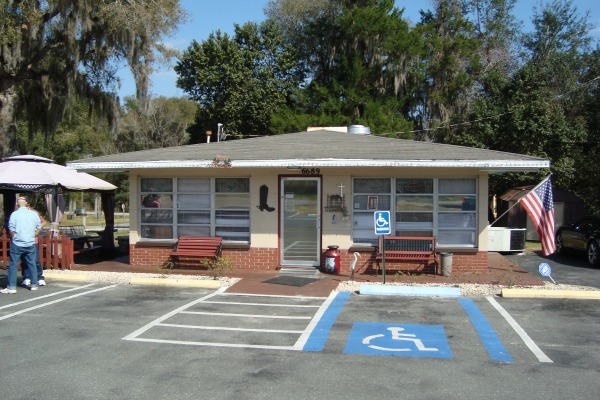 Robin's Country Kitchen is in a plain building on U.S.-41 on the north side of Floral City. The Withlacoochee Trail parallels the highway and the restaurant is tucked in between the highway and the trail, convenient for cyclists, hikers and motorists. There is plenty of parking for cars and motorcycles and the bicycles don't have a problem either. Lunch on weekends can be busy because of the large number of people who use the trail. It was busy when I dropped in, with plenty of cars, motorcycles and bicycles adorning the parking lot. It was so crowded inside the restaurant and out on the patio that I was a little nervous about how long it would take to get my lunch. I settled into the one remaining seat at the counter and soon realized I need not have worried. I drank my great cup of coffee and watched the owner and server handle everything extremely well. It was obvious they were shorthanded that day, but the kitchen staff cranked out the food in short order and the server got it to the customers at once. The inside of Robin's is not fancy, but it is clean and comfortable. It was obvious that a lot of the customers were regulars and represented all ages and types. I had breakfast on my mind, but remember seeing various other items on the small menu and daily special board: chicken salad sandwich, hamburger, french fries, Italian sausage soup, house salad, bacon and cheese omelet, coleslaw, grilled ham and cheese, corn beef hash, grits and various desserts including coconut cream pie. I had three eggs over easy, sausage patties, tater tots and silver dollar pancakes with plenty of butter and syrup, washed down with good coffee. It was delicious and reminded me of how much I like a heart healthy breakfast. Robin's is owned by a Mom and Pop couple, Robin and Robert. Robin was out the day I came in and everything was handled by Robert and his very capable server, Stacy, shown in the photo above. They did a great job. Robin's is open 7 days a week from 6:30am to 2:00pm.